In Tuscany, in the heart of Etruscan hills in the river Cecina Valley, farm-house San Maurizio is the perfect place to relax and discover Tuscan country lanscapes. Medieval villages among woods and hills, art cities like Volterra, Pisa, San Gimignano, Siena and Florence, the sea and natural parks are easy to be reached. San Maurizio is easy to be reached with the main highways and from the airports of Pisa and Florence as well. For your holidays, you can choose two houses: San Maurizio, an old farm house restored a few years ago and surronded by a wide park; and San Maurizio Alto, a new house – on the slope of a hill of olive trees – with many typical elements of Tuscan country architecture. 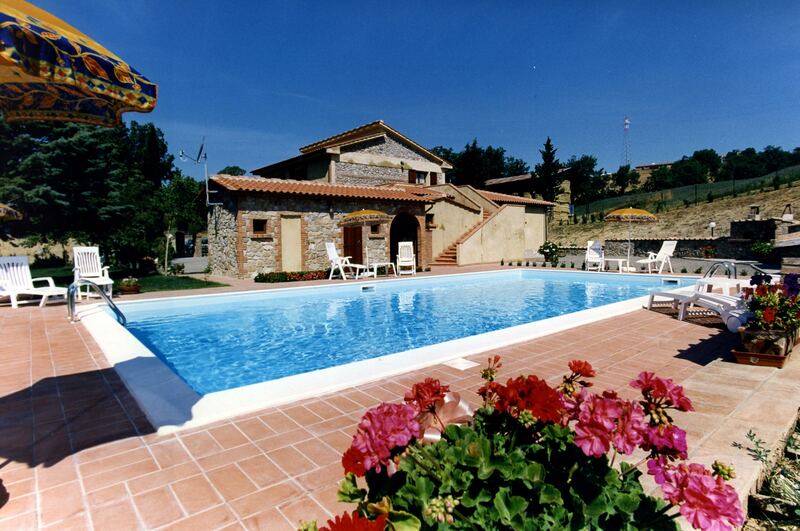 Both of them have private swimming-pools and atmosphere is painted with colors of Tuscan country. By using this form you consent to the storage and management of your personal data on our site. Linen and blankets are included in the price. The house has two beautiful private pool (6m x 12m) with solarium and is surrounded by a large park with trees, flowers and games for children. Each apartment has an independent parking space. Close to the farm house there is a small restaurant where you can have breakfast, lunch and dinner.